Hello, friends! I’m sure you’ve noticed that we don’t make blog posts very often (or perhaps you didn’t notice, since, well, we don’t make blog posts very often.) But we’ve got news to share. We will be closed from December 23rd through January 1st, reopening on January 2nd. Get your gift cards and holiday pints soon! Speaking of gifts: have you seen our new t-shirts? Or our tea tins and bagged coffee? And did we mention the gift cards? We’ve got a great selection of stocking stuffers this year! And if you haven’t tasted our new selection of teas from Art of Tea, come in and try a cup with a homemade pastry for $1 off this Saturday. Since the weather was unseasonably warm this fall, we’re just now starting to plan this year’s flight nights. Our first flight night will be Monday, January 9th. Mr. and Mrs. Parlour are traveling back to Mrs. Parlour’s home island of Saba this Christmas, and we’ll be bringing back ingredients for a very special Caribbean-themed flight. We’ll update again with the menu and ticket link when we return from our trip! 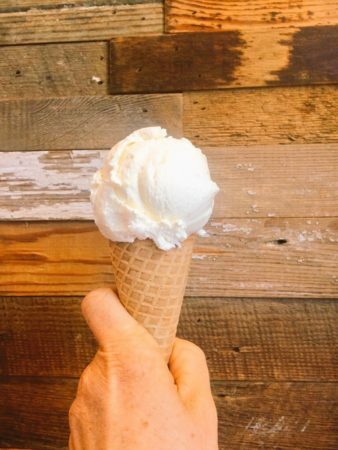 And finally: eggnog ice cream goes on the menu this week! Made with spiced rum and Homeland Creamery nog. Happy holidays! We’re very excited to collaborate with our friends from American Meltdown for a pop-up dinner here in our shop on January 23rd. There will be two seatings, at 5:15 and 8:15. The dinner features four courses—including dessert, of course. Beer from Fullsteam is included in the $40/person ticket price. Since we started scooping last May, we’ve been humbled and amazed at the great reception we’ve gotten from Durham and surrounding communities. As we fill in our schedule for another busy season, we’re excited to return some of that support by participating in several charity and community events! The first event we’re participating in is one that we’re sure lots of folks are looking forward to. Empty Bowls is a benefit for Urban Ministries of Durham’s Community Cafe, which serves three meals a day, every day of the year, to shelter residents and anyone in need of a meal. The cafe relies on volunteers and donations to keep running, and this year’s Empty Bowls event hopes to raise $30,000 to fill more empty bowls. Mrs. Parlour’s previous employer is one of the many great local restaurants contributing this year by participating in a soup competition at The Armory on March 8th. You may be wondering how we fit in, since we serve ice cream, not soup! Well, this year, Empty Bowls is having an afterparty at Fullsteam with bands and a food truck mini-rodeo. Each truck will have a special that fits in a bowl. Ours will be a sundae, naturally, and we’ll be donating 10% of our sales for the evening to Urban Ministries. The following week is the grand opening for Liberty Arts, a non-profit metalworking studio, in its new space at the Cordoba Art Center (right by the Scrap Exchange)! This one is March 16th, a 3rd Friday, so there’ll be lots going on in the neighborhood. We’re doing a super-secret promotion that night, so keep your ears to the ground for details. The very next day (March 17th) we’ll be at the anniversary celebration for Marry Durham. Last year, lots of folks came out for a civil union, parade, and reception pledging a commitment to keeping the Bull City great. The organizers raised $25,00 for five local charities in 2011. Vendors at this year’s event are also donating 10% for local charities (we don’t have the full list yet, but it will include at least some of last year’s recipients). On April 21st, we head to neighboring towns for two community events in one day. First, we’ll be at the K9-3k dog walk through downtown Raleigh. This event raises money for the SPCA of Wake County. Since the Parlour family includes 3 rescued dogs and 3 rescued cats, we’re hoping lots of people register for the walk! And we’ll have free treats for your 4-legged companions. After the dog walk, we’re heading over to Briar Chapel for their Earth Day celebration, where we’ll be contributing a percentage of proceeds to the Abundance Foundation. We’re also thrilled to be participating in this year’s Beaver Queen Pageant on June 2nd. The Pageant is a family-friendly outdoor event with music and food. It’s also a fundraiser for the Ellerbe Creek Watershed Association, which is dedicated to restoring and preserving Ellerbe Creek, which runs right through Durham (including the park where we walk our dogs). Keep an eye on the Beaver Lodge website to find out about donating or participating in the pageant! Even before all these events, we’re participating in one more thing related to our little corner of the community. Our fellow food trucker Kenny Pettis, the Pop in Will and Pop’s was badly injured in a motorcycle accident earlier in February. During the week of the February 26th, we’re joining several other food trucks to collect donations to help out with Pop’s mounting medical expenses. If you’re a fan of Will & Pop’s locally-sourced street eats, or just want to show your support for the Triangle’s food trucks, please consider making a donation. Each truck will be pitching in with a contribution of our own, too, picking one day that week to donate a percentage of sales. We’ll post a list of participating trucks in the next few days. Thanks for reading, and we’ll see y’all out and around soon!